Network Configuration Protocol (NETCONF) is a standard based IETF Network Configuration Management Protocol. With this Network Configuration Management Protocol, we can install, modify and remove the configuration of the network devices. Additionally, NETCONF Protocol reduces the cost. It also reduces the given time to the network device configuration management. Here, NETCONF does the configuration automatically, not manually. Network Configuration Protocol (NETCONF) is a Network Management protocol like SNMP (Simple Network Management Protocol). But it is a better protocol than SNMP for Network Management. 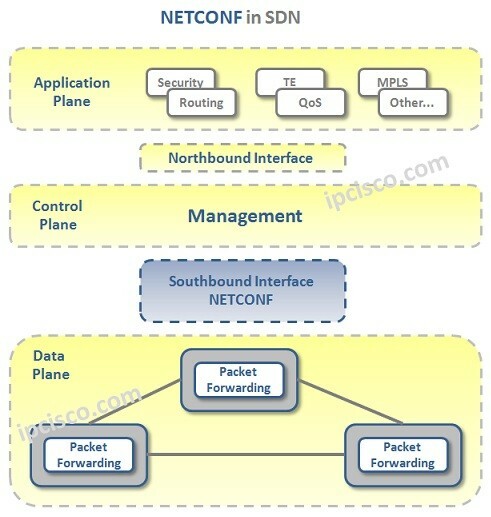 NETCONF Protocol is used in the Southbound Interface of SDN. As we have talked about before, Southbound Interface is the SDN interface that connects the Forwarding Plane and the Control Plane. Hey Buddy!, I found this information for you: "NETCONF Overview". Here is the website link: https://ipcisco.com/netconf-overview/. Thank you.